Lenny Martinelli is the owner and Executive Chef of Three Leaf Concepts, an award-winning restaurant group that includes such iconic restaurants as Boulder Dushanbe Teahouse and Chautauqua Dining Hall, as well as Leaf Vegetarian Restaurant. 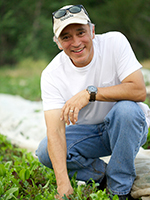 In 2010, Lenny and his wife purchased a small organic farm, Three Leaf Farm, in Lafayette, where they grow vegetables, fruits and herbs to supply the restaurants. Three Leaf Farm also offers workshops about herbal medicine, traditional foods and cooking, and homesteading skills. In 2014, Lenny was inducted into the Boulder County Business Hall of Fame for his more than 25 years in the Boulder restaurant industry. Lenny lives in Louisville with his wife, three kids and numerous dogs, cats, horses, goats and chickens. After breakfast, visit the farm, saddle up the horses and do a relaxed morning ride around the farm and along the Coal Creek Trail. Head to Boulder and spend some time walking through the Boulder Farmer’s Market. Enjoy a light lunch at the Boulder Dushanbe Teahouse and afterward, go for a hike up the Mesa Trail at the foot of the Flatirons with my wife and dogs. Then it’s dinner at Leaf — delicious vegetarian food — followed by an evening concert at the Chautauqua Auditorium, one of my favorite venues.